The IRC has presented hundreds of programs to thousands of people over the years. Many consider the IRC the expert in conservation and environmental education presentations. 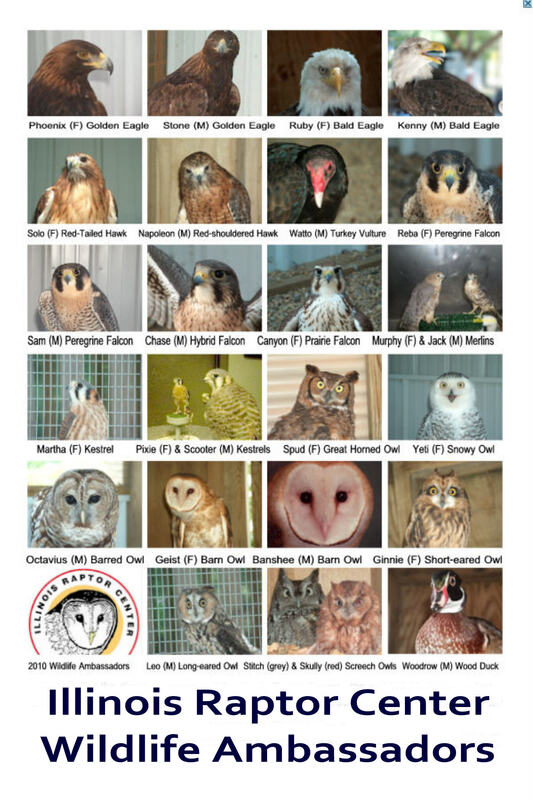 Many permanently injured birds of prey live full time at the IRC. These birds serve the community as Wildlife Educational Ambassadors. Jacques Nuzzo, Jane Seitz and these beautiful ambassadors travel across Illinois with lively, entertaining conservation and environmental programs. IRC also travels with bioartifacts (feathers, wings, skulls, feet, eggs, etc.) and real life stories to encourage youth (and adults) to get outside and enjoy nature. A list of programs suggestions and contact information for scheduling a presentation are listed below. Fees from our programs fund our wildlife hospital. Artists frequently draw inspiration from nature. The work of John James Audubon lives on today and continues to have great influence. Many others have crusaded to raise awareness of our natural treasures through their work as well. Our new "Art and Nature" program will bring up to three birds of prey into your art classroom to serve as models for young artists. Our volunteer will present a brief natural history program to introduce your students to the birds before they begin to draw or paint. The birds are extremely tolerant and will remain perched in your classroom. Students will be close enough to see them clearly. The best work, as chosen by the art teacher, may be displayed on our Website with your permission. The main purpose of a Raptors 101 presentation is to help people understand and enjoy the natural world around them. Raptors 101 provides the basic information needed to identify raptors seen while driving along the highway, hiking in the woods or cutting the grass in the back yard. We explore size, color, feathers, flying, hunting styles, beaks, feet, talons and adaptations. Raptors 101 is suitable for all ages. For an additional charge, you can add Bald or Golden Eagle to this presentation. Ever wonder what kind of hawk hovers along the highway? Have you ever seen two hawks dive towards each other in a courtship "sky dance?" How does the vulture defend itself against predators? This program will give you some insights into hawk and falcon behavior as well as a close up and personal view of these magnificent sky hunters. For an additional charge, you can add a Bald and/or Golden eagle to the presentation. Owls have always mystified people. Their nocturnal habits keep them out of sight, and out of mind. Our program will bring them into your classroom or auditorium and give everyone a chance to see and understand these amazing stealth predators. BACK FROM THE BRINK This program explores why one species may become endangered and why another species does not. Learn about those species that have come back from the brink of extinction and those that probably never will. Meet a few of these species and learn their story. People have been inspired by eagles for centuries. Religions, countries, armies and others have adopted the eagle as their symbol of power. We'll bring eagles (Bald and Golden) to your location so you can see the power and beauty of these truly magnificent birds of prey. You will also see other birds of prey that are commonly misidentified as eagles. Human have been hunting with birds of prey since 1700 B.C. This program will reveal how the ancient sport of falconry can still have an impact today. The techniques, equipment and vocabulary we employ to handle and care for our Wildlife Ambassadors are centuries old. From Ghenghis Khan, who hunted with trained Golden Eagles, to the peregrine falcon restoration program, see how falconry has touched all of our lives. INSECTS ARE COOL! Spend time exploring IRC's gigantic insect collection. The collection gathered by biology students over a 40 year period was a gift from a biology teacher who taught at the same school for all those years. This is a terrific collection and many of the specimens are in containers that can be held in the hand for inspection of the insect. Learn the connection between bugs and birds. Boy, have we got a box full of neat stuff for children (preschool to third or fourth grade). Bones, fur, leaves, and logs. All of the amazing things that we have found in our wildlife adventures are here. Your group can touch and feel all the items, no problem. Have you ever seen a hummingbird's feather? We've got one. Hear the stories behind each item, and view one of our live Wildlife Ambassadors up close. This is an interactive program. Programs can be held at IRC's Education Center for organizations and home school groups. Teachers, do you want to bring your class to the IRC? Again.......Just tell us what you need! Do you have an environmental topic in mind that we could help you with? Call us. We would be pleased to help create a program involving our animals and your specific needs. Nature belongs to everyone - click here for a sample of our creative programming. Please call well in advance to give us time to properly plan your program.